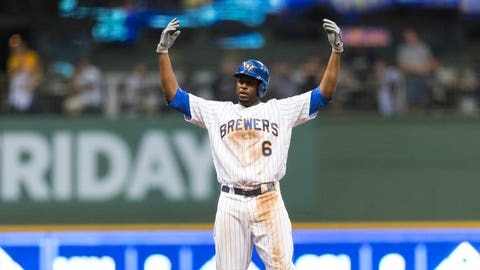 Lorenzo Cain is a little banged up heading into his third meeting with the Kansas City Royals, but when he’s on the field the Milwaukee Brewers‘ star outfielder has been at the top of his game. Cain enters a two-game set against his former team as one of just three players in the majors with at least 15 doubles and 15 stolen bases. “LoCain” leads the Brewers with 16 stolen bases and trails only team leader Travis Shaw with 15 doubles, three more than Ryan Braun and Jesus Aguilar. And while he sat Sunday after a decidedly unlucky string of injuries — a cramping hamstring Thursday, a pitch to the elbow Friday, then a tweaked groin and another wayward pitch Saturday, this time to his shoulder — Cain is expected to suit up Tuesday. Cain’s glove has been a major asset for the Brewers as well, but rookie right-hander Freddy Peralta hasn’t needed much help so far. Peralta heads into his fourth career start with a .113 opponent batting average, .230 opponent on-base percentage and 25 strikeouts, all tops in Brewers history for a rookie pitcher in the first three starts of his career. His 0.89 WHIP ranks fourth. Fortunately for Peralta the Royals are just 12-40 against right-hander starters this year. He should be able to count on slugger Jesus Aguilar for a little run support. Aguilar has been on a tear over his last eight games after a brief slump in early June. He’s hitting .385 with five home runs, 13 RBI and a whopping 1.038 slugging percentage over that span. — Peralta has dominated against right-handed hitters. They’re just 1-for-25 against him so far. — Aguilar has 42 RBI since May 1, tied with Nolan Arenado for third-most in the majors, behind Edwin Encarnacion (43) and Eugenio Suarez (44). — The Royals haven’t been very dangerous in the first inning since trading leadoff hitter Jon Jay on June 6. Kansas City was hitting an American League best .325 in the first inning before the Jay trade, but has hit just .169 in the first inning since. — If the Brewers hit even one home run, there’s a good chance a win will follow. Milwaukee is 38-11 when hitting at least one homer, the best such record in the majors.